Kids Obstacle Challenge is an adventure and obstacle course event series for kids ages 5-16, with 10-15 fun and challenging obstacles and lots of mud! 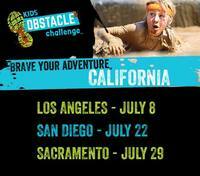 As the largest touring adventure and obstacle course event series for kids in the nation, Kids Obstacle Challenge is designed for kids to push their limits and reach new heights. And the best part is, parents get to run with their kids for free! Event Time: 8:30 a.m. - 2:00 p.m. Waves released every 30 minutes. Parking: Please, plan to bring $5 cash per vehicle for parking!